Do we need farms in urban areas? Josh Viertel, President, Slow Food U.S.A.: Yes, local urban food is more sustainable. It also helps create new connections to the land in cities — “learning connections” that create better environmentalists who are stewards of the land. Liz Falk, Director and co-Founder, Common Good City Farm: There are no downsides, except, possibly, rats. But if you plan well and compost, you won’t get rodents. Steve Cohen, food policy and programs, Portland Oregon’s Bureau of Planning and Sustainability: There is now a disconnect with food in urban areas. In many cities, you can’t grow food outside your door. Eating food you’ve grown yourself is a visceral experience. We need to look at government land for urban food production as well. Is there a viable business model for urban agriculture? Arieff noted that there are more than 100 urban farms throughout San Francisco, which have formed into neighborhood farm collectives. However, the business model failed. People have gotten invested, but there isn’t enough money in this. 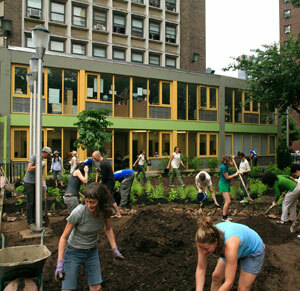 Does urban agriculture need to move towards a non-profit model? Liz Falk: We need to connect the dots between schools, chefs, farmers, and local residents. We need to work collaboratively. There are lots of job opportunities. Non-profits can turn into businesses. Urban farmers can also produce higher value jams, tea, etc. Steve Cohen: There are lots of models out there. Philadelphia’s SPIN farming is a great model that allows for 3-4 planting seasons. You can plant over and over again. In other cities, small backyard farmers are delivering produce by bicycle. Some organizations come into your garden and provide advice on what to plant (for a fee) or even farm your yard for you. For one organization, they add one employee for every 75 urban farms they work on. Josh Viertel: Van Jones recently said urban farm jobs stink, so he was not going to promote a push for urban farming jobs on Capitol Hill. In Viertel’s own experience with an urban farm, he made some $11,000 per year working 90 hour weeks. The business model didn’t work for him. How do we create more viable partnerships with businesses, government? Liz Falk: Our food programs for low-income residents in Washington, D.C. require partnering with the communities. We get feedback from the community and see what works. Micro-credit to expand micro-enterprises, a model created by Muhammad Yunus’ Grameen Bank, can work for moving low-income urban residents into farming. Josh Viertel: Does urban farming have to create a profit? Parks don’t turn a profit but they provide valuable environmental services. Urban agriculture has a public health value, can provide a carbon sink, store waste water. These farming spaces can provide a range of hard-to-quantify services. Q & A: What about green roofs and urban agriculture? Liz Falk: Washington D.C. has an innovative green roof incentive program — turning existing roofs into green roofs will get you a $5-per square foot rebate. You can add vegetable gardens on these green roofs. There are lots of opportunities to put farming on roofs. Steve Cohen: There are lots of successful examples. Green roofs have usually been used to capture stormwater runoff. They can be used for food production — these goals are complimentary. Josh Viertel: Moving from impermeable to permeable and dark to green roofs is a good thing. What about residual soil toxicity? Josh Viertel: You need to test your site before you plant. If the soil is toxic, you can plant above the soil or truck in new soil. If the soil is really toxic, you can remove the soil and replace, which is expensive. Liz Falk: Mushrooms are great at removing pollutants. There are other plants that can also decrease soil toxicity. In many cities, urban agriculture breaks local zoning codes. What is the best way to reform zoning codes? Liz Falk: In Montgomery country, Maryland, the council is currently reviewing zoning changes that will enable the use of yards for urban farming. However, there has been pushback — it’s a wealthy county. It’s important to find allies in government councils. Allison Arieff: Home resale value is hugely important, and lawns are important for this. Many people don’t care about their lawns but think it’s important for increasing the resale value. Perhaps resale value has become less of an issue with housing prices falling? This may create new opportunities for urban farming. Josh Viertel: There are now millions of people planting urban farms in the U.S.. The trend is up 35 percent over the past year. 15 percent of the U.S. now has a backyard garden. Out of a country of more than 300 million people, this is a huge trend. More than 50 percent of food is now wasted. Composting needs to be increased. The overall food system needs to incorporate and reuse food waste. “We are throwing away a huge resource.” In San Francisco, more than 70 percent of food waste is now composted. The local government has realized there is money in this. Additionally, yard waste — leaves, which are just raked into the street and end up clogging gutters, are a huge resource. Wood chips from felled trees can also be used for urban gardens. The food system currently hurts the poor and people of color the most, but these people aren’t going to farmers’ markets and buying locally-produced food. The Slow Food movement needs to broaden its appeal. The selling points need to be: this food is good for your kids and doesn’t hurt the environment. We need to address food and security. Local solutions need to be bottom-up, not top-down, and not funded by some outside foundation. Food is the “gateway drug” to sustainability. We can access these markets through kids in schools first, then parents. Local, healthy food creates positive externalities. Detroit has so much open space and they’ve created networks of local community gardens. There are two models at work in Detroit: huge farmers across many small plots and small independent farmers. Some smaller farmers resent the growth of large-scale farming in Detroit. Urban agriculture may place pressure on urban water systems. Water is becoming the “next oil,” a resource hard to come by and expensive. We can collect rainwater through cisterns. Drip irrigation systems also improve water efficiency. Through local organization and advocacy, communities can change zoning rules and create a national movement that makes urban farming acceptable. It needs to be bottom-up. I appreciate this post…I think that it’s inevitable that anybody who practices landscaping (and in New England this pretty much means anybody who owns or lives in any size property at all) will eventually have to start embracing landscaping that serves a purpose other than aesthetic, eg. rain gardens and planting to mitigate/prevent flooding and erosion, flowering lawns to reduce the chemical treatments which are polluting nearby streams, lakes and coastal bays, strategic planting of evergreens and deciduous trees to cool/shade/insulate homes and cities at various times of the year, home and community vegetable gardens to offset the rising cost of fresh/healthy foods, vegetated lakeside/stream buffers to protect clean water supplies and provide essential habitat for pollinators and other essential wildlife, all of these practices will become mainstream as we try to protect our fragile ecosystems from the forces of nature. Good luck to us all! goodday. we are from mumbai india and have done work on cityfarming.